Use this SUP downwind video tutorial to improve your downwind technique. Read the article I wrote for standupjournal.com below about the art and meditation of downwind paddling. 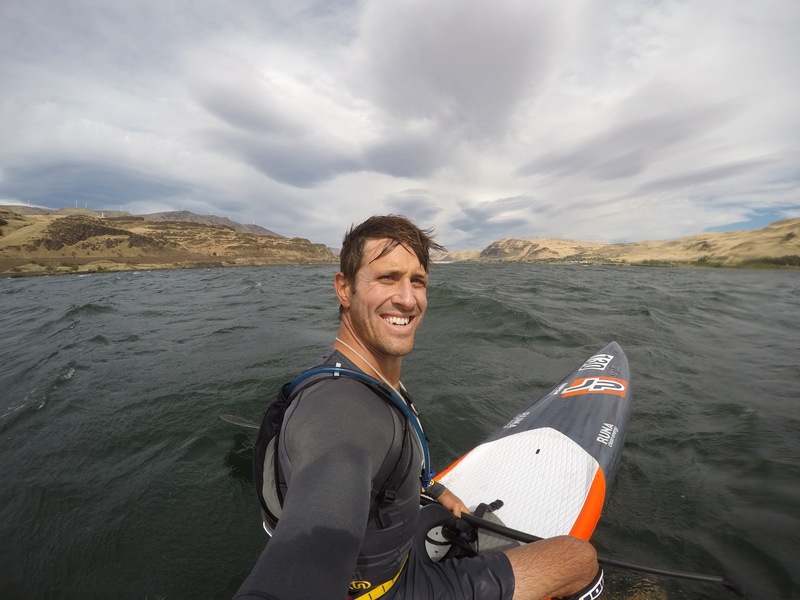 If you would like to learn how to downwind paddle in-person then you can join me next summer in Hood River, Oregon at one of the Downwind SUP Camps. Learn more and reserve your spot today! Paddlers, windsurfers and kiters flock to Hood River from around the world, for among other things, the strong and consistent wind. I don’t think I could ever get bored of the challenge and thrill of downwind paddling in such a beautiful place. Not only is downwind paddling fun and a great workout, but I find it to be deeply meditative. For the entire time I’m paddling I concentrate on the water in front of my board, looking for the next bump to catch and connect to another wave. The search for the next wave requires a full focus on reading the water and maintaining balance. There is a certain rhythm to paddling that is accentuated during downwind paddle sessions. When you are doing it right, everything comes together in a beautiful dance on the waves. With a good rhythm the glides come effortlessly and everything is calm as I surf downwind, deep in a paddling meditation. In addition to being an exercise in meditation, downwind paddling can teach you a lot about life. Don’t pee into the wind, patience in dealing with tardy downwind shuttle paddlers and two tie-downs are always better than one. On a seriously note, downwinding can really teach you a lot. At the top of the list would have to be, less is more. Paddling hard and fast does not always equate to improved downwind speed. Case in point, I recorded my fastest 8-mile downwinder on a day that I was not particularly trying to go fast. My time of 1 hour and 2 minutes on Wednesday, September 14th, was more than 1 minute faster than my time at the Gorge Paddle Challenge a few weeks ago. Of course I was trying very hard at the GPC, one of the world’s biggest races. Last Sunday I flew to southern California to compete in the Catalina US Outrigger Championships. My body was still very sore from the grueling race. I had no intention to go hard in a SUP downwinder just three days after so much punishment. Halfway into my record downwinder I had barely broken a sweat and everything was connecting and flowing effortlessly. My body was relaxed as I connected wave after wave. I maintained this rhythm for most of the 8-mile downwinder and finished comfortably with a new personal best time. Previously I had set out on other sessions with the intention to beat my best time and came up short. I have not completely mastered downwind paddling, that’s the beauty of it. There is always something new to learn and improve upon. However, there is one thing I know for sure after my new record, less is more! I’ve developed a mantra based on this philosophy with the acronym, A.B.S., Always Be Surfing. The more you are catching waves and gliding, the less work you will be doing and the faster you will go. This is a gross oversimplification of the intricacies of downwind paddling, but it’s a nice reminder to myself to relax and focus on maximizing the glide of each wave.